Last week we celebrated the 43rd anniversary of the Apollo 11 moon landing. Being a person that loves history and space, I’ve always felt drawn to this particular era in space exploration. There is something about it that is majestic and noble. I’m not quite sure what it is, but I do know this. I love how we were never deterred, even when things were beyond difficult. I love how we weren’t afraid to reach for really big things. I love how we turned grandiose ideas into actual realities. I love that we weren’t just impartial observers of the heavens from the ground, but that we actually became part of this new frontier. I wanted to share with you, especially in light of recent comments by political leaders, my thoughts on the first moon landing, and what it means to me. In May of 1961, President John F. Kennedy delivered an address to Congress that forever changed the nation – and the world. Smack in the middle of the Cold War, President Kennedy challenged America, and America answered the call. What a challenge! Some thought he was crazy. Developing a manned space program to travel to, and return from, the moon in less than 9 years? This wasn’t a science fiction movie. How could that even be accomplished? 9 years! He knew it would be difficult, but he wanted this done in 9 years! NASA easily could have backed out and said that it just wasn’t enough time. The public would understand that. But, they didn’t. And the American public proudly stood behind NASA and the space program. The astronauts were heroes- idolized by the public. 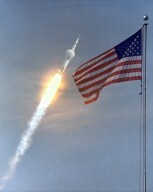 People looked at President Kennedy and NASA as great patriots. Everyone was excited by the possibility of actually landing a man on the moon – and not just any man, but an American. It obviously wouldn’t be easy. 9 years is not much time when you are talking about traveling almost 239,000 miles away, and coming back home. 9 years. It would require tremendous effort, but we weren’t afraid of the challenge. In fact, we welcomed it. 19 months after his address to Congress, President Kennedy again addressed the nation, this time from Rice University. The whole speech is really amazing, but one part in particular stood out to me. We do it because it is hard. Did you catch that? Because it is hard. Wow. This is profound to me. We aren’t taking the easy road here. We want to be the leader in space exploration. We want the American flag to wave on the moon. Of course this won’t be easy, but we are Americans and we do things because they are hard and challenging. We are up to the challenge and we will lead the entire free world in our quest for knowledge of the worlds beyond our own. Talk about American exceptionalism. Holy cow! Sadly, President Kennedy didn’t live to see it, but his challenge was answered. On July 20, 1969, Apollo 11 reached the moon, and Neil Armstrong and Edwin “Buzz” Aldrin were the first people to land on the moon. It was an absolutely amazing! What an amazing feat! What a grand accomplishment! Never before, in the entire history of mankind, had man set foot on the moon. And there we were. 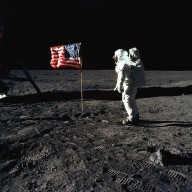 Our flag flew on the moon. America rejoiced. America celebrated. America took pride in this amazing accomplishment. We knew this would open doors we never dreamed possible. We knew what this meant, not only for America, but for humanity. This was something simply astonishing. In thinking about this, I had to ask myself if we could accomplish this today. I honestly don’t know, which makes me feel sad. Heartbroken and mournful for the country I love and for what once was. A once hard working America, that wasn’t afraid to dream big, has turned lackadaisical. An America that once valued hard work and study, is now caught deeply in the entitlement trap. An America that once rewarded and praised success, now villainizes it at every possible chance. And America that once was self sufficient now expects others to save us. An America that once embraced creativity and innovation, now discourages and wants conformity. An America that once stood tall and proud, is now far too apologetic. I just don’t know if we could do it now. But once, we did. Once we stood together in a moment of absolute greatness, and we were one. One in pride. One in accomplishment. One in spirit. One nation. One people. United in splendor. In that moment, we dreamed. We dreamed lofty and grandiose ideas, and we celebrated those dreams. For we knew we could accomplish anything. I Survived Global Warming…And All I Got Was More Regulation! That’s right, we’ve survived Global Warming! Boy, was that close! Whew! Global Warming is officially OVER! But, wait, I thought Al Gore’s Nobel Prize proved it was all true! I said earlier, his Inconvenient Truth was a Convenient Lie! Turns out the predictions were wrong. What a farce this all was, and now it’s finally coming to light! I mean there have been so many times it has been discounted, but now, I guess it’s official! I, for one, couldn’t be happier! But, you know what’s coming, don’t you? It’s the new ice age…now it will be global cooling! Oh no! The hysteria! It happened before. Brace yourself, you know it’s coming. I wish they’d make up their minds, already! I guess they just need something to nag us about and to regulate. I wonder what it will be next year? Global Warming…or cooling…or well, the left has to have something to nag us about! Al Gore seems to have paved the way for all the “global warming” nuts. In his film An Inconvenient Truth, he supposedly explains all the terrible and horrible effects of “man-made” global warming. Sadly, it’s full of exaggeration and non-factual things. Even Gore admits this, but basically says that the idea of it is true. How can we believe something that is full of false facts and exaggerations? Gore, himself, doesn’t abide by the standards of “green” living that he has set forth for the rest of civilization, but that doesn’t stop the left. They are constantly nagging us about how we live, and being carbon friendly. They even have a new thing, championed by Gore himself, about how if you use a ton of energy, you can purchase carbon offsets. What a crock! Let’s remind everyone, these are the same people that 30 years ago were worried about another Ice Age! Global cooling was the chief worry of the time. What people don’t realize is that the earth NATURALLY goes through periods of heating and cooling, all by itself. As human beings, we grossly overestimate our impact on the planet. We’re cooler now than when the dinosaurs were roaming the earth. There were no SUV’s then, or regular light bulbs, or other things the left claims to be destroying our planet. One might find it interesting to look at the different environmental “scares” over the last hundred or so years. Also, in contrast to Al Gore’s movie, here’s one the BBC (of all groups) produced. People need to remember that because some scientists have reached a “consensus” that global warming is man-made, there are just as many scientists that believe quite the opposite. Science isn’t about consensus, it’s about fact. The fact is that man-made global warming cannot be proven. I haven’t even seen anyone try to test the theory. Also, I have a HUGE problem with schools forcing students, and in some cases parents, to watch Gore’s movie. Schools seem bent on teaching and preaching this man-made global warming stuff, but don’t seems to want to present any opposing view. This is simply wrong. I’ll tell you this, if my children are ever forced into this kind of garbage, and fed false information masqueraded as fact, I will throw the biggest fit that school or teacher has ever seen. I refuse to let my children be a party to that. If it’s going to be taught in school, BOTH sides should be presented. So, before you go getting all worried about being the cause of the planet’s destruction, get all the facts. You’ve got to be kidding me!!!!! Among the nominees for this year’s Nobel Peace Prize, is former Vice-President, Al Gore. He was nominated for his work on global warming. When I heard this, I said, “You’ve got to be kidding me!” Forget the fact that global warming is a controversial issue. Personally, I tend to believe that it’s not a man made phenomenon, and so do many scientists. That all aside, what in the world does global warming have to do with peace? How is “raising awareness” about global warming at all related to peace? I just don’t understand the connection! On top of that, all he has done is make a movie and spew a lot of useless, one sided facts. In his eight years in office, he didn’t actually DO anything about “global warming.” Actually, he still hasn’t actually DONE anything, except make this movie. I am just beside myself with this. They believe he should be counted among the likes of Mother Theresa and Dr. Martin Luther King, Jr.! I don’t believe it! This is absolutely ridiculous to me! Can anyone give me a good explanation?